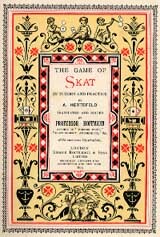 Skat is one of the very few classic card games whose invention can be ascribed to a particular circle of players at a particular place and time - namely, around 1810 by members of the Brommesche Tarock Club at Altenburg, some twenty-six miles south of Leipzig. And it is surely unique in boasting a monument dedicated to it. 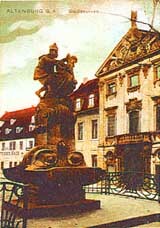 Taking the form of a fountain surmounted by a statue depicting the four Jacks in conflict, it was erected in 1903, melted down for its bronze in 1942, but fortunately recast and restored in 1954. The leading light of the story was an advocate by the name of Friedrich Ferdinand Hempel. 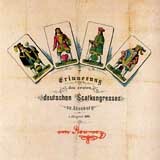 Hempel's coachman had been travelling in the Erzgebirge and there picked up a local variant of the more southerly game of Schafkopf, which he brought to his employer's attention knowing him to be a card-playing enthusiast. It was version of the game with all Unters (Jacks) as top trumps but without Obers (Queens) as second tops (unlike most varieties of Schafkopf), and with Ten ranking low between Ober and Nine. It was either played by three or converted to three-handed play by Hempel's circle, who were more accustomed to three-handed Tarock. The principal stages of development were outlined by Hempel in an 1818 issue of the Osterländische Blätter, and in further detail by Professor J. F. L.Hempel in 1833 and 1848. At first, the dealer received 12 cards to the others' 10 each, made two discards	(skat = "discard"), and sought to take 61+ card-points in a trump suitpreviously cut from the pack. This risky business was soon changed by dealing thelast two cards to the table and allowing each player an opportunity to become the soloist by picking up the skat. In another version, bells (diamonds) were made permanent trumps, as in many forms of Schafkopf. In another, bells could be overcalled by hearts, which won or lost double, hearts by leaves (quadruple), and leaves by acorns (octuple). By 1820 a major innovation, credited to Carl Adam Neefe, permitted a simple skat-exchange bid (Frage) to be overcalled by a "solo" or "hand" game. Game values were now 1-2-3-4 for Frage in bells, hearts, leaves, and acorns respectively, and 5-6-7-8 for the same played solo. There was no grand or null, and bids were made by suit, not by value. 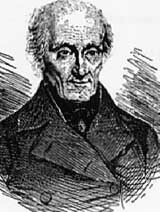 At the time of the 1833 description Skat was spreading throughout Thuringia, having by 1826 reached Leipzig University and thus entered the circulation of the nineteenth-century equivalent of wandering scholars. Tens now ranked high, and in some unorthodox circles extra payments were being made for the holding of "matadors", or consecutive top trumps, a feature borrowed from Hombre. At first, such payments were end-of-play extras and had no effect on the bidding, which was still carried out by suit - that is, a bid in a higher suit beat an equivalent bid in a lower suit regardless of the number of matadors involved. Some players, however, especially students, replaced simple suit-bidding with that of raising according to the value of the game they expected to win with the eventual score for matadors included. This meant that a bid in a given suit could now be overcalled by an equivalent bid in a lower suit played with or without a greater number of matadors. The traditionalistseferred disparagingly to this practice as Räuber-Skat ("Robber Skat", because a player with a promising game in a high-valued suit could be "robbed" of his due by an upstart low suit more strongly supported by matadors. The struggle between suit valuation and game valuation would remain a contentious feature of the game for many years to come. By 1848, a number of variations were being introduced from other games such as Hombre, Tarock, and Boston, probably independently in a variety of places. These included grand and null, both originally playable only from the hand, and both castigated as unnatural by the purists. Both also had variants. Däuserspiel was a grand in which Unters (Jacks) were not trumps but ranked in each suit between Ober (Queen) and Nine, thus making Däuser (Deuces, the equivalent of Aces) invincible. Nullogrand was a null played in grand format, i.e. with Unters (Jacks) as trumps. By 1867 some circles had borrowed from Hombre the bid of tourné (German Wende), whereby the highest bidder undertook to turn the top card of the skat and accept its suit as trump. At a later date he could play "second turn" if the first did not suit him ("Paßt mir nicht"). Several varieties of Ramsch are recorded by Hertefeld in his classic work of 1884, as well as such aberrations as Uno and Duo - both played as at grand, but with the object of taking exactly one or two tricks respectively. Other peculiarities included the announcement "mit Spitze", whereby the soloist undertakes to win the last trick with the lowest trump, and the decidedly eccentric bid of Spitzengrand, in which cards retain their point-values but rank upside down in each suit, from Seven high to Ace low. The indigenous Skat-players of Thuringia objected to such fripperies for the difficulty of deciding and remembering whereabouts they all fitted into the bidding schedule - a problem less acute in Leipzig, Berlin, and the north, where players preferred to bid by game value rather than suit value. If no form of Skat could yet be rightly designated standard, that described by Hertefeld in 1884 is at least typical of its time. The base values for diamonds, hearts, spades, and clubs, respectively, were, in Frage 1-2-3-4, tourné 5-6-7-8, and solo 9-10-11-12. Grands counted tourné 12, solo 16, ouvert 24; and nulls had fixed values tourné 16, solo 24, both doubled if played ouvert, and "revolution" 72. The last-named was a null ouvert so invincible that the opponents were invited to show their hands, discuss the position, and exchange as many cards as they liked before playing. Like most experts, Hertefeld countenanced neither null nor grand played with simple skat exchange, though both were practised - the former under the name Kauf- or "Purchase-" null, the latter as Gucki or "Peep" grand. Stronger and more widespread objections stemmed from the fact that two players from different circles, let alone different parts of the country, could hardly sit down for a bout of "Skat-threshing" (Skat dreschen) without first going through a lengthy check-list of mutually acceptable games, values, bidding procedures, and pay-offs, with the risk of total dissatisfaction with the resultant compromise. Thus arose, in the wake of German unification and the founding of the First Reich in 1871, an equally patriotic move towards the unification of the new state's national game, culminating in the first National Skat Congress at Altenburg in 1886 and the promulgation - if not exactly the widespread acceptance - of the first Allgemeine Deutsche Skatordnung (General Rules of German Skat). A second soon followed at Leipzig, and the third, at Halle-Saale in 1899, saw the founding of the Deutscher Skatverband. In 20th-century post-war Germany	its West German descendant moved to Bielefeld, but with German reunification it has reverted to Altenburg. Whether these early congresses actually achieved unity is questionable. Delegates and officials made such a claim, but perhaps only amongst themselves, and because it made them feel their efforts had been worth while. How attuned they were to general practice may be gauged from the official insistence o playing with German-suited cards, when sales of French-suited Skat cards were three times as great, and on the Altenburg practice of bidding by suits when most of the population followed the Leipziger practice of bidding by game valuation. Ramsch was not admitted as part of the official game, a ruling that "officially" applies today, even though nearly everyone still plays it, except in tournaments. Subsequent congresses continued to endorse the original Skatordnung until the 1920s, by which time it had fallen even further out of step with everyday practice. During the First World War, Skat underwent considerable levelling at the hands of soldiers constantly on the move and mingling with their regional compatriots. The distinguishing features of what was now called Leipziger Skat were (a) bidding by game valuation and (b) the admission of a grand played with skat-exchange, whence the alternative name Gucki-Skat. The eleventh Congress (Altenburg, 1927) agreed to adopt for a one-year experimental period the Leipziger Skatordnung first published in 1923, and its ratification in 1928 established the main lines of the modern German game. Tourné was abolished, as were differing suit-game values in favour of the universal 9-10-11-12 with an extra multiplier for hand-play. Grand and grand ouvert were respectively valued 20-30, and the fixed nulls 23-25-46-50. In 1932 these were revised to 24-36 and 23-35-46-59, and in 1937 the system was completed by the admission of suit games playable "ouvert, with Schwarz declared".
? Stakes are played for, and, if so, how high. Failed contracts played from the hand are now lost double, instead of single as was the case before. 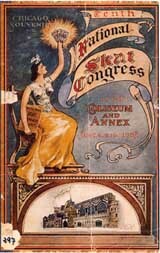 Skat was taken to America by German immigrants and a series of Skat congresses along similar lines to those of its home country began at Brooklyn in 1887. An American Skat League was founded in 1898 at the fourth of the series, which continued in 1926. American Skat could be described as a streamlined version of the German game prior to the substantial revisions it underwent in 1927-8. Whereas German Skat kept the simple Frage or skat-exchange bid and shed that of tourné, American Skat instead abandoned that of skat-exchange in suit (though not at grand). The base values of North American Skat are tournée 5-6-7-8 and solo 9-10-11-12, making the lowest possible bid 10 (diamond tourné with or without one). Grands are valued at 12 for tourné (optional if a Jack is turned, the other choice being to play in the suit it belongs to), 16 guckser (with the skat), 20 solo (hand), 24 ouvert. Null and null ouvert, playable only from the hand, count 20-40 respectively. Players acquainted only with the German game may find the American one more stimulating. Properly approached, tourné is not as chancy as it sounds. It sometimes forces you into playing with only four trumps, which, though something of a challenge, is by no means unwinnable, and is very rewarding to win. Grands have more sensible values, and the rejection of nulls with the skat has much to commend it. Ramsch, played when no one is prepared to bid, is an integral part of the official rules. or perhaps we should say "was", as it now seems to have gone into steep decline. Hoffmann, title page played in Texas. The Texas Skat League, established 1924, favours a form of the game still called Robber Skat. It shares the streamlined values of its North American cousin, but, as in Germany, retains the simple exchange game in place of tourné. The recent disappearance of its web site suggests that it, too, may be on the way out.